But while some people think the colloquialism is just a silly bit of advice about staying positive and having fun, the truth is that laughter is actually an amazing medicine. Various studies have shown laughter can have positive effects on senior health, improving everything from acute or chronic pain to general wellbeing. In fact, a study out of Loma Linda University in California found that older adults who watched 20 minutes of funny videos a day had reduced levels of cortisol (also known as the stress hormone) along with improved health, memory and cognition. Laughter also releases endorphins, which can improve pain perception and lower the risk of depression – now that’s a medicine everyone can get on board with! The best way to laugh more is to spend time with friends who you feel completely comfortable being silly with. 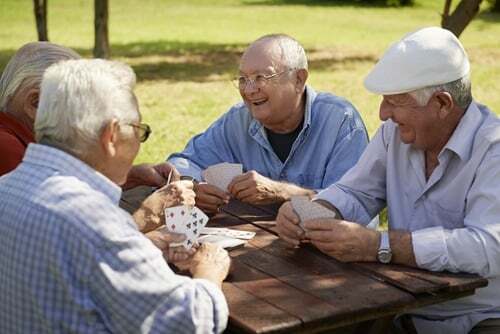 Invite some other residents to play games with each other once or twice a week, and see who has the funniest stories to tell. Go to a comedy show or see a new funny flick at the movie theater. Bring along some friends and spend the afternoon enjoying each other and whatever activity you choose to do. Laughter yoga is a little-known form of therapy for adults and seniors who need a little humor in their lives. The activity, which was developed in the 1990s, is a great way to get active and, of course, laugh more. No matter what activity you choose, the most important thing is to take some time each day to indulge in whatever you find funny!